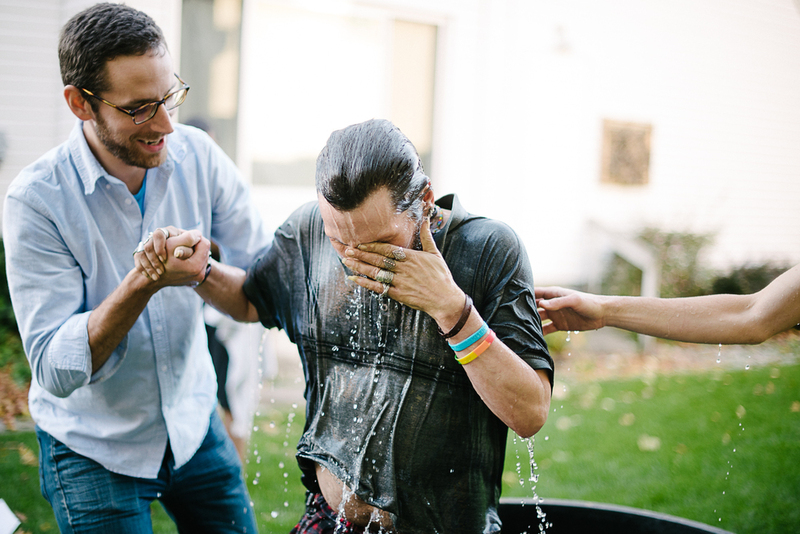 We are absolutely thrilled that three of our neighbor-friends were baptized last month in our simple Church gathering! Kevin, Tammy, and Eddie have been undeniably pursued and captivated by The Father, and we stand amazed at what the Spirit is doing in their lives. We were all especially surprised by the sudden turn of events following Kevin's baptism that led to Jesus welcoming Him to his eternal home. To honor and celebrate him in his passing, I want to dedicate this post to sharing Kevin's testimony. After a close call with death and encountering Jesus earlier this year, Kevin began turning his life around, committed to daily surrendering every corner of his life to Jesus. Kevin spent around 7 months in the hospital and nursing home due to reaching a dangerously low weight and blood count in late 2013. While in the hospital, Kevin explained that he actually died at one point and met Jesus. No words were exchanged, except that He pointed Kevin back to where he had come from. The look in Jesus' eyes communicated to Kevin all that he needed to know--to walk in new life when He returned. And so he did. As we visited Kevin throughout those months, Kevin requested to pray together at every visit. When he was healthy enough to be released, he returned to the Sunday church gathering testifying that Jesus had given Him new life--a second chance, that he knew that this was his family, and that he wanted to be baptized. Jordan and I began meeting with Kevin regularly to seek God about the questions: "Who is God, what has He done, and who has He called us?" and "What does it look like to walk in surrender, forgiveness, and freedom with Jesus as Lord of every part of our lives?" Thoughtfully and enthusiastically, he began surrendering different areas of his life to the Lord as the Spirit led him to, from past addiction and sexuality all the way to areas of unforgiveness, relationships, and how he treated people. He would walk out of the prayer garage declaring that he felt like he had a ton of weight lifted off of his shoulders. With the temptation of past addictions to alcohol creeping in, he came to evening prayer often and asked for prayer and accountability that he would not give in. On October 8th, Kevin, along with two others, stood before about fifty people in the yard of the Boiler Room house, shared his testimony, and was baptized. It was a beautiful day and we all celebrated. Exactly one week after he was baptized, on October 15th, Kevin suffered a major stroke in the early hours of the morning. We stood around him in the hospital bed with family, saying our goodbyes and thanking God for his life before he passed away that night. We bless God for His redemption and grace over Kevin's life--and that he truly is walking in new life! You can read another more personal post about Kevin written by my wife on our family blog here.